These Craftsman exclusive engines deliver the power and performance you need to get the job done. For light-duty jobs, the Silver Series™ engines provide easy cutting with lighter, quieter mowing. Equipped with the exclusive Smooth Start™ System featuring the Most Reliable Starting (MRS) Sparkplug, the Silver Series engines provide easy and consistent starting every time. The Gold Series™ engines are the best combination of value and performance for medium-duty jobs. 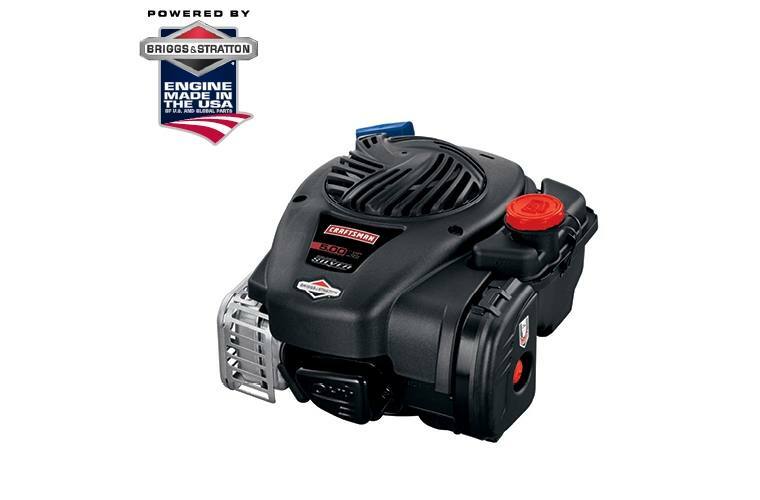 With easy handling, reduced vibration and quieter operation (thanks to the Super Lo-Tone™ muffler) these push mower engines are also easy to start with the exclusive Smooth Start™ Plus System featuring the Most Reliable Starting (MRS) Sparkplug and the Briggs & Stratton ReadyStart® Starting System, with no prime, no choke, just pull for power. The Platinum Series™ mower engines bring you the durability and power you need in a high-performance lawn mower engine for medium to heavy-duty jobs. These push mower engines include the automotive-style paper filters to protect again dirt and debris for longer engine life and the exclusive Smooth Start™ Plus system, featuring the Most Reliable Starting Spark Plug and the ReadyStart® Starting System with no prime, no choke just pull for power. Torque: the True Measure of Lawn Mowing Power: Cubic centimeters (cc) only measure the size of the engine on your lawn mower or outdoor power equipment. Torque measures the power that rotates the blade. Maximize your mowing power. MRS Spark Plug: Most Reliable Start (MRS) sparkplug for easy starting. Optional: Smooth Start™ System: Available on Silver™ Series models for easy starting with the MRS (Most Reliable Start) sparkplug and push-to-prime fuel. Optional: Smooth Start™ Plus Starting System: Available on Gold™ and Platinum™ Series models for easy starting with the MRS (More Reliable Start) spark plug AND Briggs & Stratton ReadyStart® Starting System with no prime, no choke just pull for power. New for 2017! Just Check & Add™, Never Change the Oil! : The first gas-powered engine to never need an oil change, just simply check and add oil for the life of the engine. Silver, Gold, and Platinum Muffler Options:: Lo-Tone™ Engine Muffler available on Silver Series models for a quieter cut and Super Lo-Tone™ Engine Muffler available on Gold™ and Platinum Series models for an even quieter lawn mowing experience. Silver, Gold, and Platinum Air Cleaner Options:: Oil-Foam Air Cleaner available on Silver Series models to help keep the engine clean and Dual-Sealing Paper Element available on Gold and Platinum Series models to protect the engine from dirt and debris. Optional: QPT® Featuring Just Check Add: Just Check & Add™, Never Change the Oil! : QPT® Featuring Just Check Add: Just Check & Add™, Never Change the Oil!